Before anyone read any further, try to answer the following question. What you see is a pool of water sculpted into a pond using concrete. There are sticks above it forming what looks like the skeletal structure of a tent roof. Pardon the picture quality for it is taken in a moving car and I was sitting on the wrong side. This was taken in a farm. Guess what's inside the pond? Make a guess first and I shall reveal it as I trudge along with this entry. As many were aware, I was in GuiLin over the weekend for a golf tournament but I decided to skip the first day of practice round to go visit a supplier there. The factory was right at the outskirt of the city and you could tell almost immediately where the city ends and where the rural side starts. When we made a right turn off the main concrete road, we immediately found our car bouncing up and down the gravel path. Ah... the end of the city limits. It was a small path with farm houses on one side of the path and farms on the other side, lining the entire length. You don't see anyone around. It seemed as if nobody was working. From what I can see, this is a orchard but unlike most orchards that I've seen, this one look very messy and unkempt. You know this is still an active orchard as it is still quite a long way away from abandonment. Very strange considering the trees are planted haphazardly when you would otherwise expect a neat layout for efficient harvesting and tight layout for maximum number of trees per square foot of land. Then there were these artificial ponds which initially I thought was a water reservoir for irrigation purposes. However, I was told otherwise as it was a pond for rearing. "Rearing what?" I asked. "Fish? Shrimp? Tortise?" "Nothing." my host answered matter-of-factly. "They were built to rear nothing." As it turned out, the land that we were on was earmarked to be taken back by the Gahmen as the city continues to expand. The fact that we were on the immediate outskirts means that acquisition of the land is just round the corner. Farmers are compensated according to the type of farm that they own. According to the compensation guidelines, fish farms and fruit orchards are entitled to a higher rate of compensation as compared to say, a piece of land for farming of certain crops e.g. lettuce or radish or yam. As such, these farmers rushed to plant fruits trees and built ponds without really intending to genuinely farm it. 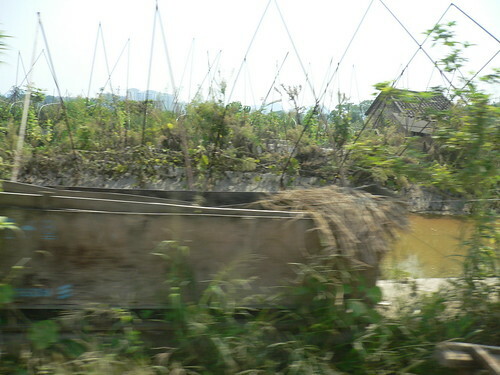 These fruit trees and fish ponds were just symbolic representation of fruit orchards and fish farms respectively, which would translate into more moolah during the acquisition compensation. last time my uncles oso did similar things before we were made to move from our kampong. plant fruit trees, do up concrete ground etc... to get more compensation from gahmen. it's in the chinese blood lah. hitomi: Frankly, I don't know enough to make a judgment call here. On one hand, it appears that the farmers are cheating the Gahmen, but on the other hand, it could mean that the farmers are trying to get back at the Gahmen in view of the less-than-fair compensation. Yup, my family also did that when we were make to move from our kampong house to HDB a long time ago. We had planted lots of fruit trees, especially papayas. Sly: Hmm.... sounds to me this is common practice for everyone. Clearly...we know less than we think with regards to what 'the rest of the world' does..! I realised this yesterday when friends came over and we were talking about the usual benefit frauders out there... and the mindset these people have (generations of people not working, therefore growing up on govt handouts and not thinking anything wrong with having holidays and plasma tvs courtesy of the govt and the rest of us).. v different from ours. I'd just found out yesterday that if one was a single mother and unemployed, the govt just gives you £500 cash (to help pay for baby expenses). not bad huh, given that there are people out there who work damn hard as supermarket check out people etc, ALSO to earn £500 after tax. Pam: Again the never ending debate between the merits of a republican (conservative) vs a democrat (labour). The ideal democrat is a better option IMHO where everyone is being taken care off i.e. no one left behind. However, the problem is that we have too many people taken unfair advantage of this and milking the system for all it's worth, at the expense of others. Hence the republican's theory of meritocracy stipulates that you get what you work for i.e. the good old "a day's wages for a day's work" in the aim to leave behind those who chose not to keep up. However, in a world where nothing is perfect, it may mean leaving behind those who are geniunely unable to keep up. Brilliant! Yes, milk the gahmen while they still can :D IMHO, compensate from gahmen are mostly not fair one lah. slurp! : I guess when both sides cancel out each other with their respective cheating, the deal even out nicely at the end of the day.